I often dread Mondays. After spending full days together as a family on weekends, I start developing a bit of a “funk” on Sunday nights – as I consider the weight of the responsibilities that lay ahead in the coming week. But, last Monday was different. I had one of the sweetest experiences in Trader Joe’s. Since Trader Joe’s is one of the places that I can navigate with relative ease with all three children, the kids and I went to do a little shopping. It is relatively common for people to stop to engage the children, commenting on how full my hands are, how sweet the girls are, or how helpful their big brother is as he pushes his toddler-sized grocery cart that our local Trader Joe’s provides. Last Monday was no different, except, it was. After a bit of time exchanging pleasantries with a few people in the frozen food aisle – we went on our way. A few minutes later, one of the women, a sweet grandmotherly German woman, finds us. When we talked earlier, she had gushed over the children, speaking of how sweet this time is, how hard it is, but how she misses it, and how big of a job it is to care for children. She unexpectedly walks up to me, holding her hands to her heart saying, “From my heart… from my heart…You have such a big job. You have a lot on your hands. It is hard. Hard. Big.” After saying this, she presses a $100 bill into my hand. “For the children.” As I protest, she insists, “No. NO! From my heart, for your sweet children. Your job is hard. Big. For the children. Put it away safe.” With that, she gives me a big hug, a quick kiss on the cheek, and continues her shopping. I stand there, reduced to tears, as the children stare at me. I barely make it thru checkout. When we finally get settled into the van, I break down. You see, the previous week was a difficult “mommy” week for me. An odd cold/respiratory infection left me exhausted and unable to sleep for several days. The children were at odds with one another and me. I could not seem to pull it together, could not grab a moment to compose my nerves, or decompress, and I lost it, failing in gracious responses to my children’s antics time and time again. I announced to Reggie, several times, “I am going to look for a full-time job. I can’t do this. I can’t stay home any longer. I can’t. CAN NOT. I’m not cut out for this. It’s hard. Too hard. It’s time. Ican’tdothisanymore!” I started visiting online job search sites thru the blur of tears. But, Ms. Ann did not know any of this. She just felt in her heart that she needed to acknowledge this stage, this season that I am in, with not only words, but deeds. Do you have any idea how it is to have a complete stranger, somehow knowingly look you in the eye, grab your hand, hug you, give you a gift while acknowledging the difficulty of your current reality, using the very words you were screaming out with defeat and despair less than a week before? THAT is overwhelming. It still brings me to tears. To know that God heard me railing against my current situation, wanting to bail out because it is “hard”. And, to know that His response to me in this instance was grace. Not a circumstance to bring me to my knees in despair as “payback” or punishment for my lack of faith, or gratitude, (which I often expect), but grace – a sweet kiss to let me know that He heard me. He sees me. And I can do this because this is where I am supposed to be now. And He is here. He sees. And, her actions convict me. She had no idea who I was, who I am. She hadn’t a clue as to how difficult my previous week had been. She doesn’t know how much money we make, or don’t make. What my political affiliations are. What God I worship. If I needed the money or not. In fact, she had no idea that just the week prior, I told a friend about my negative experience when I was in Germany briefly. She didn’t know and didn’t care. She saw a mom who she believed needed encouragement, as she provided just that – no conditions and no strings. How often I fail in loving and encouraging another because I have conditions. Simple things like letting someone cut in line, doing a favor for another, stopping to have a conversation instead of rushing to fulfill my agenda, giving to someone regardless of if I think they need it or not. I fail. Miserably. I may not see Ms. Ann ever again. But her kindness to me is a priceless gift that I will treasure for years to come. 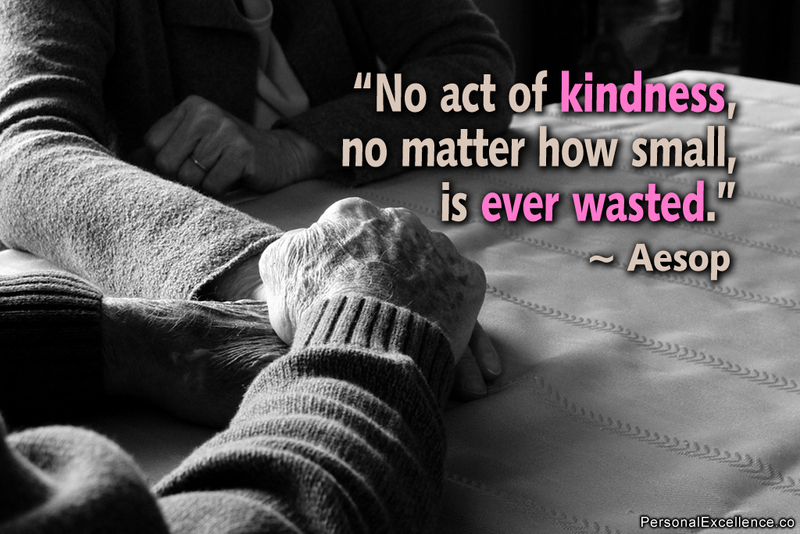 Long after the money is spent, I will remember the significant impact of one act of kindness. May I continue to share that lesson in word and deed.